As Chairman of the Korean War Veterans Welcome Committee, Jack Gordon was more than just the emcee for the welcoming of hundreds of troop-ships with 500,000 U.S. veterans from the Korean War. Barclay Girls danced at Pier 36 on Seattle's waterfront as part of the greeting Gordon headed for soldiers returning from Korea. A typically happy Jack Gordon adjusts the microphone while Kay Stevens, singer, welcomes the 100,000th returning Korean War veteran. Welcome Lane honored by Seattle Chamber with its "Blue Ox Award" for 1951. (Coming soon) Photos of Mrs. Gudrun Baker's "Bank Girls" welcoming the soldiers home. Pageant Magazine's coverage of Gordon's Welcome Lane. 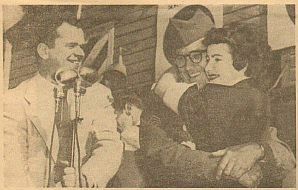 Newspaper photos from December, 1952: Kay Stevens returns along with the 137th Troop ship to arrive in Seattle.